Sure, standard table numbers will get wedding guests to their seats, but why be ordinary? Express your personality with creative table names, or upgrade your style with unique ways to display the classic numbers. These 50 innovative table number ideas will inspire you to take your table décor from mundane to memorable. Driftwood sailboats complement the seaside décor for a nautical or beach wedding. Unique Brazilian agate rocks are hand-painted with elegant calligraphy. Antique-look key plates and crystal doorknobs adorn these gorgeous custom table numbers. Perch these handmade bird cutouts atop a dried floral nest for a charming rustic look. Can you spell C-R-E-A-T-I-V-E? Scrabble tiles make up fun and novel table numbers. Search thrift shops and antique stores for pretty vintage china. Next stop: the crafts store, for stencils and acrylic paint to complete this easy DIY idea from Perfectly Disheveled. For a glamorous Art Deco look, go for the gold. These freestanding wooden numerals can also be styled modern, rustic, or covered in sparkling glitter. Create your own amazing folded book art with downloadable patterns by Jelly Bean Book Art. Light up your table décor with luminaries. The vellum shades fit over a wine glass or champagne glass. Engraved acrylic hearts are illuminated by LED lights matched to your wedding colors. Retro library cards add a vintage feel to your table. Pair with some classic books for a novel centerpiece. Vintage books can be stenciled with table numbers. For a special touch, select your favorite romantic novels or books of poetry. Imagine your summer beach wedding with these colorful buoy table numbers, handmade from reclaimed wood. Add this handmade wooden trunk to your table decorations for a vintage-inspired centerpiece. Love to travel? Take a flight of fancy with airport code table names. Foodie couples will adore this elegant design by Nora Belle Designs, celebrating a passion for fine food and travel with classic Italian ingredients and inspiring quotes. Relive memorable moments as a couple with photos of your favorite adventures. Choose your favorite spring flowers for table names. A pretty seed packet design is a sweet choice for an outdoor wedding. Sleighbells, snowflakes, mistletoe, and holly — for a winter wedding, the Documents and Designs Snowflake collection includes table names that salute the season. Add a bit of Hollywood romance with quotes from your favorite movies. When two scientists fell in love, it was instant chemistry! Cibi Events labelled each table with chemical formulas like H2O for a clever addition to an elegant table setting. Take me out to the ball game! Stadium seating is a fun choice for the sports-loving couple. Cassette tapes with names of your favorite artists are perfect for a retro wedding. Tag tables with your favorite movie characters. This beautifully styled table combines a sophisticated look with a fun Star Wars theme. Where in the world are you sitting? Upcycled maps display your favorite destinations. Pow! Splat! Express yourself with quirky comic book table names, a fun and offbeat choice. Name your tables with references from a favorite movie, book, or television show. These fantasy fiction destinations are paired with vintage maps by Imbue You. Your love is written in the stars. Guide your guests to the nearest constellation. Opt for some serious bling with gold crystal wrapped table number holders from Gallery 360 Designs. Vintage salt and pepper shakers have a charming shabby-chic look. 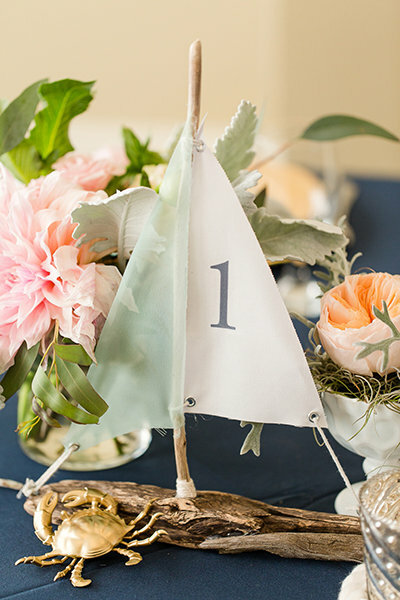 Pretty DIY flower pot centerpieces hold moss-covered numbers by Spotted Leopard. Rustic pine holders are carved with your initials for a bit of old-fashioned romance. Shell holders add sophisticated gold style to your beach wedding. Handmade “monkey fist” rope knot holders are perfect for your nautical-themed wedding reception. Handmade wire sculpture bicycles hold your table number cards. Order a tandem bike for the head table! These delightful table number cards feature vintage-inspired flapper girls. You do the math: a clever twist on table numbers features simple arithmetic on chalkboards. Enhance your table number cards with delightful artwork, like these vintage bird illustrations. “I love you… I know.” Download this sweet and subtle Han and Leia design. Let your personality shine. This clever couple incorporated super-sized number props in their engagement photos. Add glamour to your table number cards with a peacock print Art Deco design. A swath of bright color and elegant gold lettering transforms ordinary table number cards. Download lovely floral chalkboard cards for a trendy rustic look. Is there an artist in the family? Take a cue from these adorable drawings by the happy couple’s son. An innovative DIY project from Intimate Weddings features a lacy heart handmade from perler beads. A simple gold frame elevates your table number cards from plain white to classic elegance. Silver and pearl embellishments frame your table numbers with opulence. Moss covered frames are ideal for an outdoor or garden reception.